Christmas Special: The FinTech Fairy Tale | Caution – Irony Inside! Looking at business volumes, the market share of FinTech for most financial products is still more or less a rounded ZERO. As an example we show corporate funding from banks (loans only) and FinTech (all forms of crowdfunding) in the chart below to the left. Diving deeper into specific product categories the picture changes slightly. As we show in the chart below to the right CrowdInvesting for startups is almost half of German seed venture capital. Even if we add further components of early stage startup funding such as early stage VC and angel money, CrowdInvesting still represents 2% of the total. This is likely to be at the high end of FinTech market shares for individual products. Nonetheless, it is probably fair to say that most FinTech startups and products are still (!) fairly marginal in economic or market share terms. Looking at public perception and media coverage, however, FinTech startups already seem to hold the upper hand versus banks or at least have a significant share of voice. 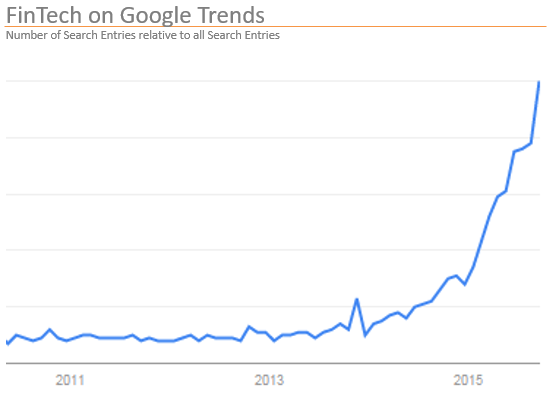 As a reference we show the development of google search volume, which literally blew through the roof in 2015. Thus, the gap between economic significance and public awareness could hardly be larger. The most obvious answer in our view is, that people usually do not get very excited about sheer numbers. Our brain doesn’t like them. Our brain doesn’t remember them very well. So we swiftly forget about FinTechs 0% market share in Germany. On the other hand people love (telling and listening to) good stories. On top, we remember them very well and for a long, long time. This is where FinTech scores big time! (Investment) Bankers realised the importance of story telling early on and created so called equity, debt or credit stories in order to raise capital for their corporate clients. Marketers discovered story telling as the holy grail to reach customers. In order to figure out, what’s needed for a good story, we turn to tales that have been told for centuries: The classic hero epic or fairy tale. The princess is young, beautiful, rich and might even be a bit naive. In short: Her royal highness has everything one could possibly ask for. We are likely to envy her for the stunning life she leads. The princess and her envidiable life literally calls for a villain to come. Our villain, often a bad witch, wants to steal her youth & beauty, her wealth and possibly even putting an end to her life all together. This is, when the hero enters the scene. Our white knight protects the princess, fights with the villain/witch and chases him or her away. Heros often possess superpowers to fend off bad witches/villains. For his efforts the hero often gets rewarded in the form of gold or treasures and sometimes even with the heart of the princess. The latter we the call Happy End. Our Princess is the bank customer for obvious reasons. The customer doesn’t receive interest payments on deposits any more, pays 10% interest rate on overdrafts and now even free of charge current accounts become scarce. Clearly, they are after the best our Princess has to offer: Money! Our hero or saviour is effectively a whole army of FinTech startups. As they are very small, they usually do not fight alone. They are equipped with superpowers such as transparency, low prices, advanced digital technology and state of the art UX. The latter is start up speak for user experience/friendliness, a mystic art that has long been forgotten at most banks. David versus Goliath (or small versus big). White Knight With a Dark Soul? It might therefore very well be, that our white knight has a dark soul too. After a short period of rivalry our white knight (FinTech) and bad witch (banks) got fed up with fighting against each other. Nowadays, they increasingly join forces and battle together for the heart (or money) of the princess. Revolution is called off and paves the way for collaboration, as it seems. 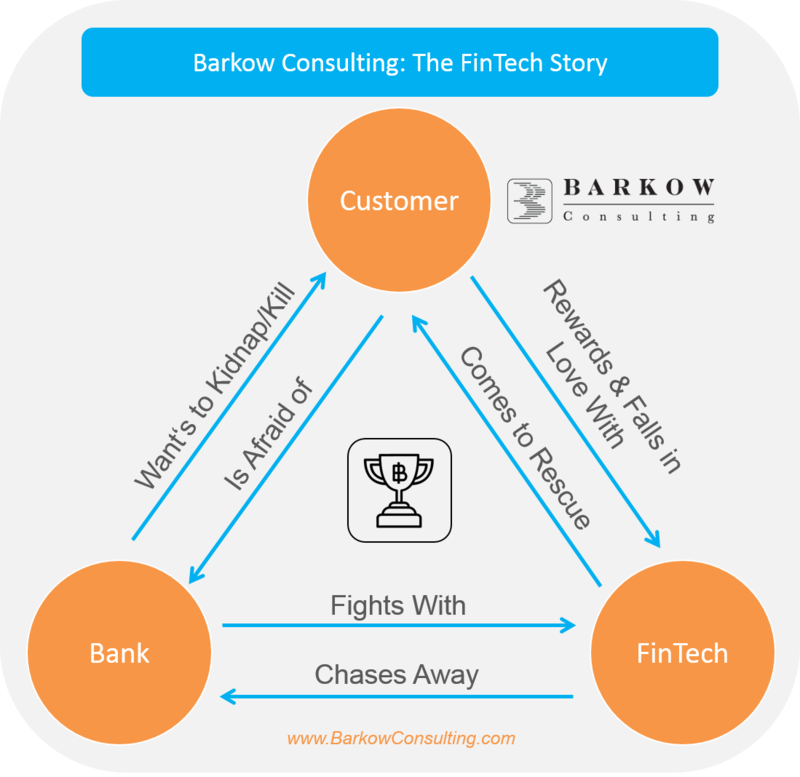 Although our FinTech Hero Epic is still developing, one outcome seems quite likely already: No matter who will hold the upper hand (FinTechs or banks), our Princess (the customer) will likely have a Happy End anyway. She will benefit from technological advances and from competition or collaboration between banks and FinTechs via lower prices, higher transparency and improved user friendliness.